Darwesh, 65, and his extended family were among thousands who fled the predominantly Yazidi town of Tel Azer in northern Iraq a few weeks ago when Islamic State (IS, formerly ISIS) forces attacked. They have now made it over the border into a camp in Syria. With hundreds of families, he escaped to Mt Sinjar where they slept eight nights before a route was cleared to the west into neighbouring Rojava, a Kurdish enclave in northeastern Syria. Like thousands of others, Darwesh and his family decided to summon whatever strength they had left and attempt the trek down the corridor to Syria. “I thought we would die on the mountain. We didn’t think we would get off it. But we heard they had cleared the corridor so we thought let us die on the way down. We thought that would be a better death. Now we have life after death. Newroz camp. 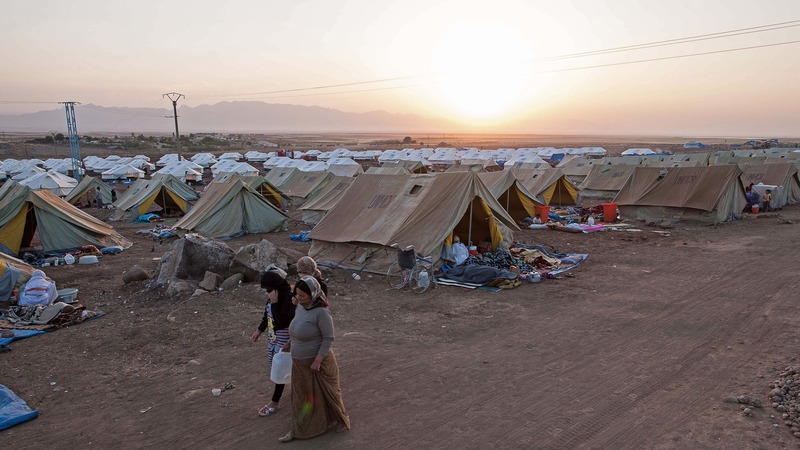 Situated next to the town of al-Malikyah in Rojava, Syria, Newroz was initially established to shelter Syrians displaced from the ongoing Syrian civil war. Al-MALIKIYAH (SYRIA), 17 September 2014 (IRIN) - Nearly 1.8 million Iraqis are estimated to have fled their homes since January 2014, with most fleeing the rapid advance of the Islamic State (IS, formerly known as ISIS) as it swept through much of western and northern Iraq in June, destroying towns, attacking communities, and sowing fear across vulnerable sectarian lines. “I knew my mother [85-year-old Goze] couldn’t make it walking but I didn’t know how I would carry her. The distance was so far and I am no longer a young man and my strength is not like it once was. But I would rather be killed than leave her to die alone. There was not a choice. So I carried her. “I held her on my back, and here [pointing to his shoulder] and in my arms. We walked and rested when we could; a journey of five days. We slept in the dirt and wore the dust as we walked. “Many left their mothers and fathers up there. They could not walk because they [the elderly] were too old and they [their children] could not carry them. I saw two older women and two men left on the rocks. They were dying, slowly, but they were surely dying… The air was like the sun there. So hot and dry we did not even sweat. Water just disappeared. “We have a new life now. It is something like we died in the last two weeks when we left our home. There is nothing left there and then the mountain took almost everything. Hope was little. Even I don’t know what this new life is. I am thankful we are alive but it will be difficult. There is no returning. “ISIS will not be defeated unless America comes. ISIS is very strong… They are friends with death and do not fear it.